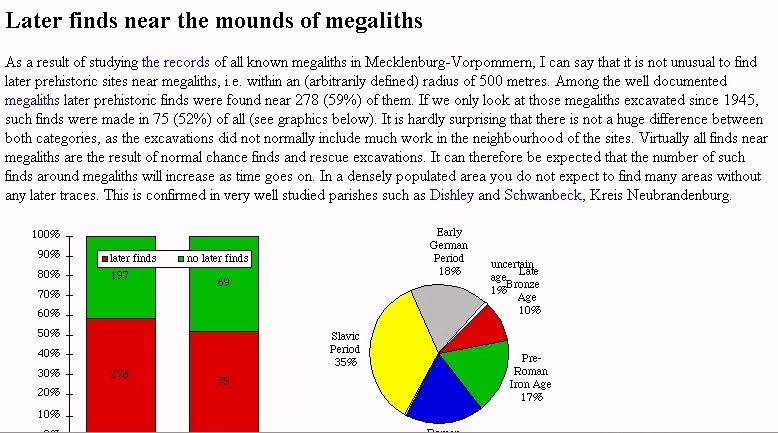 Monumental Past: The Life-histories of Megalithic Monuments in Mecklenburg-Vorpommern (Germany) by Cornelius Holtorf. How were the megaliths of the area socially and culturally meaningful, and how are they meaningful today? 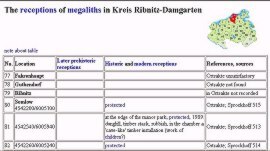 Are there cultural memories which helped the megaliths acquire cultural values in later prehistory? 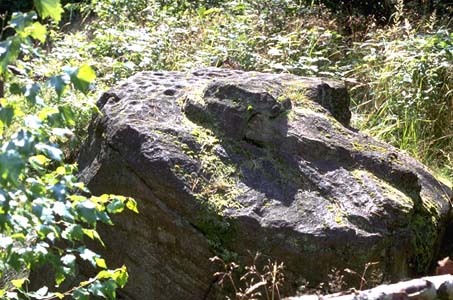 Did later prehistoric people in the area connect the megaliths with their ancestors by endowing them with particular interests, concepts, and ideas? The results of his labours appear not in printed form, but as a hypermedia document presented both on a CD-Rom and on the Web. He presented his doctoral dissertation in this format as well (see Internet Archaeology 6), on the grounds that this was an effective way of presenting what he describes as an open-ended inquiry. The author tells us that he will continue to add to the research at intervals and when the urge moves him. One is somewhat at a loss as to how to describe this multimedia presentation, but clearly the author considers it an invitation to explore, a database with freeflowing links to all manner of topics. 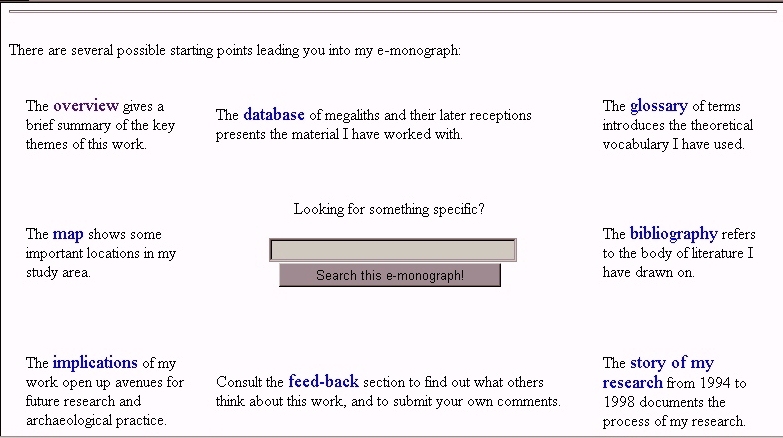 An admirably clear home page indexes the space, listing the various broad sections - overview, 'the story of my research', the database of the megaliths and later reactions to them (the main meat of the presentation), a section on the implications of the inquiry, a bibliography and a glossary of theoretical terms. (It is a sad reflection on today's archaeology that such glossaries are considered de rigueur. What is wrong with plain English?). A feedback section contains reactions to the research from other workers and casually interested people, comments which, for the most part, add little to the intellectual inquiry. There is also a search feature, which guides the browser to specific sites or topics. The story of Holtorf's research project is presented by a series of documents, which include progress reports to his funding sources, an academic story of the project, and his research diary, as well as his proposal to present his dissertation in a hypermedia format. The academic account tells of his early fascination with what monuments mean, which arose from his MA thesis on the meanings of megaliths and menhirs in Germany. 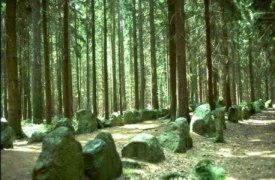 For this study of the meaning of megaliths in later prehistory, he chose the well-studied megaliths of the Mecklenburg-Vorpommern area, so that he could focus on the issue of interpretation rather than hard archaeological evidence. He assumed that past and present are inextricably linked, using a Radical Constructivist philosophy - which means that epistemology was never a concern. 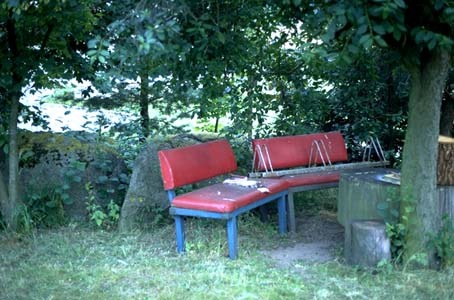 Holtorf tries to create connections between monuments built in the Neolithic, their later prehistoric receptions, and their historical and present receptions. He examines the monuments from three contexts - the diachronic biographies of the megaliths as seen from today, cultural memories and topical contexts, as well as his own theoretical context. Holtorf argues for a symmetry between his role in the present and the role of the later prehistoric people he studies. The entire project is described as involving an 'interpretative approach'. 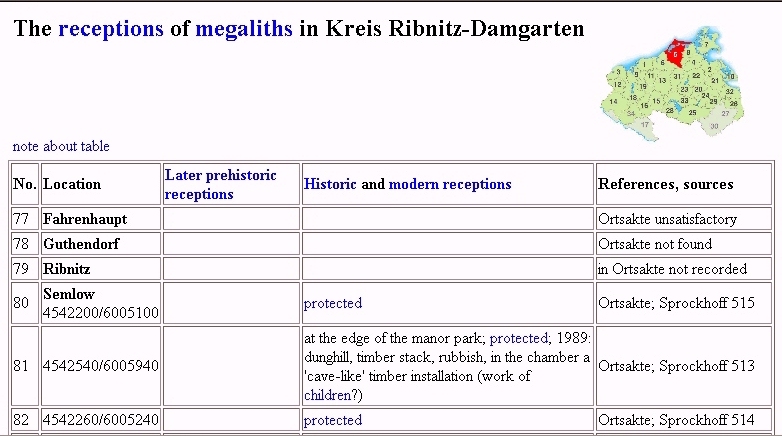 The main body of Holtorf's work is a database of megaliths grouped by geographic area. Each megalith is inventoried, with columns describing both prehistoric and modern 'reactions'. There are some links within the tables, which take you to pages on such topics as 'Study', the history of research, 'cup marks', a description of the human-made rock depressions found in the vicinity of some monuments, 'protection', and so on. The idea is that you click on a site of your choice, then follow whichever links excite your interest. The trouble I found is that I came back to the same essays on, say, reuse of the megaliths or monuments as parish boundaries, again and again. The amount of background information in the link essays is generally superficial, sometimes to the point of banality. For example, the section on 'Folklore' raises a fascinating issue, but all one finds is a summary of major themes, and no reference to the original sources (except for bibliographic references to relevant publications). It is as if the author is giving us listings instead of analysing the original folklore. To use this as a means as gauging reaction requires an exhaustive analysis, not just a summary. The database is exactly that - an inventory of reactions to monuments, accessed through links, which occur only at certain places. This condemns the user to a search for links which may not occur in every table, a tiresome and time-consuming process, especially for the computer-illiterate like myself. I found myself begging for a coherent narrative, for some guidance through a palimpsest of impressions. It took me hours to figure out that there was really relatively little information about reactions in the database. And, as far as I could tell, I was supposed to find my way through it to form my own conclusions and impressions. Holtorf does not provide us with his general conclusions from the study. Instead, 'Implications' contains suggestions for future research. Do, for example, archaeologists who are interested in interpreting ancient monuments want to pose questions about the 'future concepts implied in monument building'? How diverse can interpretations of a single monument be at different times, and what will they necessarily have in common? To what extent do previous interpretations inform our current views? Are there archaeological sites of memory and timemarks? How do cultural memory and history culture relate to specific monuments? What is the role of archaeology in our society relative to both the past and monuments? Holtorf argues platitudinously that there were many meanings for the Mecklenburg-Vorpommern monuments, many of them far from the narrow focus of academic and heritage interpretations, and he believes that is up to everyone to define the meaning and significance of ancient monuments (just as his study is an attempt to 'give meaning to ancient monuments in the present'). Thus, my conclusions will vary from yours, and yours from someone else's. In this perspective, he follows Ian Hodder's oft-quoted argument that his conclusions, and those of others, are 'momentary, fluid, and flexible' as new relations for the megaliths are considered (1997, 694). So what are we to make of this piece of research? Frankly, I found it hard to grasp exactly what the author was intending. The readers are left to draw their own conclusions, which, I suppose, is the purpose of an interpretative approach. Yes, we all have different reactions to the archaeological record, but it is not enough merely to record the impressions of others and to leave the reader guessing as to the researcher's own impressions. As I browsed backward and forward through the web pages, I found myself begging for some linear signposts, some narrative and structure. I feel that this kind of laissez-faire research really has little use except to gratify the intellectual inclinations of the author - and just how important a priority is that? There is little intellectual rigour here, and little of more than the most general impressionistic archaeological value. Time and again, I found myself asking what the purpose of this research was. 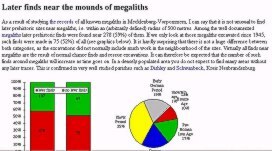 I doubt if it has significantly advanced our knowledge of the Mecklenburg-Vorpommern megaliths, even if Holtorf provides us with a database of some value to fellow researchers. Holtorf makes a great play of this being one of the first dissertations ever submitted in hypermedia form. He is to be commended for his bold experimentation, for this format has enormous potential for archaeological publication. His pages are easy to navigate, the instructions clear, and the design clean. Unfortunately, however, the desire of the author for everyone to navigate through their material according to their own inclination means that there is no structure to lead the user through the research. Anyone who enters this web space is confronted immediately with the issue of how to read, indeed decipher, it. You soon learn that there is no linear direction, rather a veritable spider's web of sites, links, and yet more links. You literally follow your nose and curiosity as you browse from table to table. It is up to you to establish linear connections and a sense of the varied reactions to different sites. Nowhere are there any intellectual signposts for the user, nor are we given any coherent sense of the differing quality or adequacy of the data, nor, amazingly, do we ever learn what the author thinks, beyond vague statements that seem to suggest that your interpretation will be different from his and that this won't matter as we all approach the past differently. I emerged from a lengthy browse through the database asking myself if I was missing something by being confused - or was I committing an archaeological sin by not doing my own thing and coming up with my own personalised interpretation of late prehistoric reactions? When I tried, there was not enough data to do so. Ideally, multimedia documents are interactive and multifaceted, offering the browser many options in reading them. This is fine when there is an overall plan, a sense of direction through the research, where a well-briefed reader can deviate from a signposted central route, and return to it or not as he or she wishes. Holtorf has given us no conceptual background or guidance at all. One enters the home page, then does one's own thing - which is hardly a useful way to study such a complex and fascinating subject as intangible reactions to megalithic monuments. I left the monograph wishing that he would now sit down and write us a conventional (or multimedia) monograph on the same subject, which would tell us WHAT he studied, WHY he studied it, HOW he studied and assessed the quality of his data, and WHAT conclusions he himself drew from it. This could easily be a component of his multimedia document, while allowing a visitor to browse of free will, instead of the free-for-all that confronts the reader. After all, intellectual discourse results from agreement and disagreement, which is why we develop our own conclusions from data. Without the discipline of a backbone and well-structured organisation, this monograph is effectively useless. Nor does the author make good use of the full potential of a multimedia format. The illustrations are inadequate and we have, for example, only one illustration of a cup-marked rock and only a few of megaliths. Again, this could be a rich resource for the monograph, which is sadly lacking. At best, the thinking behind this research is undisciplined. Holtorf does no service to what is an exciting and fast-developing form of archaeological theory. The serious researcher might find better examples elsewhere. Hodder, Ian, 1997 'Always momentary, fluid and flexible: towards a reflexive excavation methodology'. Antiquity 71, 691-700. Response from Cornelius Holtorf - posting to intarch-interest list 8 May 2002.